Essex pigs were developed in the United Kingdom. Essex pigs are popular because they are easy and cheap to keep. The modern day Essex was developed by breeding local pigs in area denoted in the Essex area. The original Essex, also known as the Old Essex, was a small black and white pig. By the nineteenth century, the Old Essex was improved by crossbreeding with imported pig breeds. Although the breed had been changed, they still remained popular until the 1950s, especially during and after World War Two, because they retained their hardiness and independence. In 1955, a report was released by the Advisory Committee on the Development of Pig Production in the United Kingdom stating that the variety of pigs throughout the United Kingdom was hampering competition with foreign pork producers, specifically Denmark. Breeders were then encouraged to focus on producing the large white, the Welsh, and the Landrace breeds. Because of this, the Essex pig experienced a major decline in population. 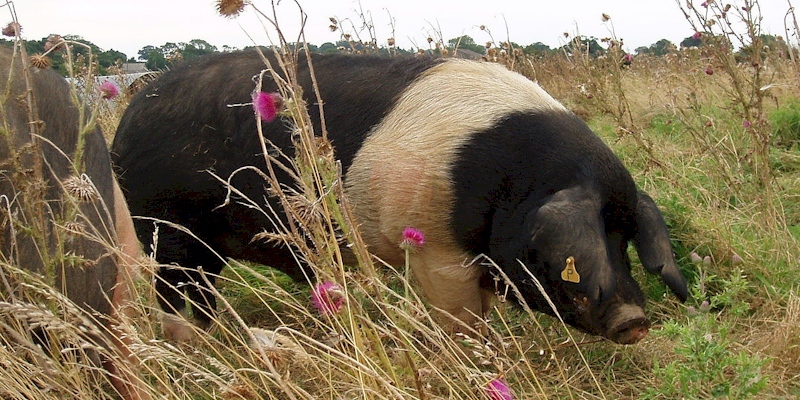 The Essex pig and Wessex pig, a similar breed, had joined together by 1918, but the official end of the Essex breed occurred in 1967, when the studbooks of both the Essex and Wessex were combined with that of the British saddleback in hopes of improving breed characteristics. It was thought for many years that the Essex pig became extinct in 1967, but one farmer named John Croshaw had not combined his pigs with the other breeds. This herd, known as Glascote Herd, remained pure genetically, although it was registered as a herd of British saddlebacks. In 1997, the Essex Pig Society was formed to help promote education and re-establishment of the Essex breed.